Knowing what to pack in your personal item is an art. It’s honestly kind of a learn-by-doing craft that has taken me years to perfect. 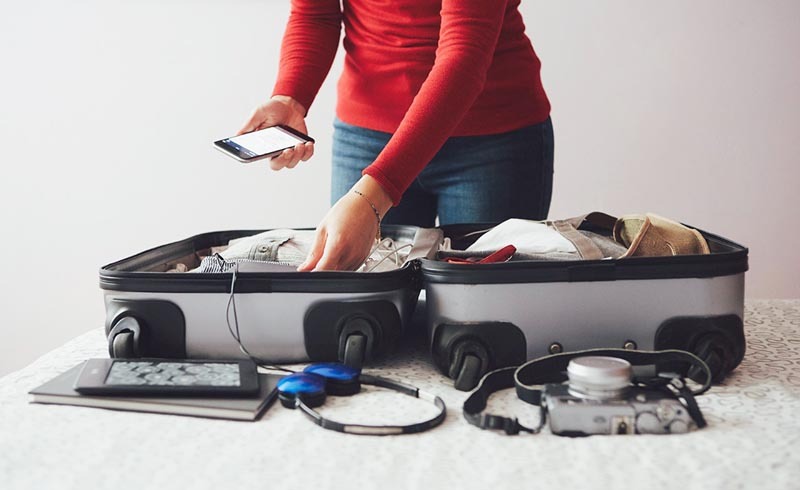 So, with that, in addition to the obvious things you should bring with you on the plane (like your passport and wallet) here are a few must-have items that will make any flight a whole lot more enjoyable. I’m talking travel pillow, sleep mask, earplugs, and a blanket. Some airlines tend to provide these products in complimentary amenities kits on longer international flights, but it’s not guaranteed. Plus, I really enjoy having my own stuff, just so I know it will be clean and that I will be cozy. That way, I can rest up and arrive ready to jump right in to the local culture! To ensure the highest level of comfort, wear layers and definitely bring a jacket and socks. There is nothing worse than being unable to sleep because you feel like you’re in the frozen foods aisle. That said, you also don’t want to land in Hawaii wearing jeans and a wool sweater with no tank top underneath. Bring books or a Kindle/iPad. If you plan to watch movies or listen to a podcast, plan ahead and make sure you download the content you need before you get in the air. And don’t forget your headphones or charging cords! Pro Tip: This is the time to leave your fancy Bluetooth headphones at home and pack a durable, reliable pair that will work with the in-flight entertainment system and your phone or tablet. There’s nothing worse than boarding a transcontinental flight only to realize you’ll have to watch every movie with subtitles because your headphones aren’t compatible with the input in the armrest. And don’t forget to bring a pen! Better yet, pack two. Pens are crucial for crosswords and Sudoku, journaling, planning your itinerary (the old-fashioned way), and filling out custom forms! AC and recycled air lead to serious dehydration. That’s why I always bring a refillable water bottle with me most places. So, drink up before going through airport security, and then fill up as soon as you’re through. You’ll love having the “extra” water with you on your flight. Dehydration is pretty lame, and asking the flight attendant for 4 waters is not going to earn you any brownie points. Once you’ve taken care of thirst prep, stash some snacks! Make sure you pack food that will make it through security (sorry, no hummus) and survive being trapped at the bottom of your backpack. Packing healthy, simple snacks will keep hunger pangs at bay and you save money, so you can save up on the plane and then overspend on local cuisine. Thirst isn’t the only result of dehydration—dehydration can impact how the rest of your body feels as well. Because of this, I typically travel in my glasses and always keep eye drops and my contacts with me. Having other essential toiletries like lotions and lip balm is also key to sanity. Believe me. Staying comfortable during your flight is crucial, but your arrival is important too! There’s just something about having freshly brushed teeth that makes you feel ready to tackle whatever is ahead of you, whether it’s a tuk-tuk ride through Bangkok or an Uber during rush hour. Fill a lightweight toiletry bag with a toothbrush, stick of deodorant, make-up, and any daily medications you may need (in case of a delay). This way you can freshen up mid-flight or before landing. I hate to say it, but sometimes your bag doesn’t make it. And when it comes to traveling, it’s always best to prepare for the worst. Whether your bag gets lost or the flip-flops you boarded the plane with aren’t going to cut it once you arrive at your snowy destination, you will be thankful for a change of clothes upon landing. So pack a fresh shirt, extra pair of socks, and some clean underwear. You could carry a large tote, but my “personal item” of choice is a backpack. I love all the pockets and organization, plus I’m hands-free as I’m traveling through the airport… which means I can scroll through my Instagram feed and sip my Starbucks without any issues. 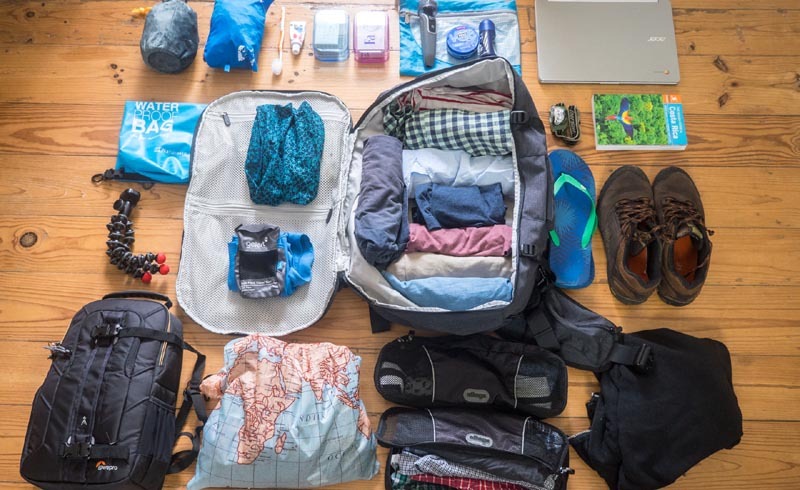 So, there you have it—a foolproof packing list that’ll make any flight a breeze. With a perfectly packed personal item, getting to your destination will seem like part of the vacation.